We are loving the Compo 1 range from the 2015/16 collection by adidas hockey, the combination of this years features and the XTREME24 shaft bow we can review that the adidas V24 Compo 1 might just be the best hockey stick in the adidas range. It will obviously depend how you play whether you agree with this reviews standpoint on the V24 Compo 1 being the best. For me the 24mm curve, 300mm up from the heel of the adidas V24 Compo 1 is awesome for wingers, defensive mid-fielders and defenders. Each of these positions requires a stick you can control the ball with. From receiving the ball reasonably softly due to the material composition in the V24 Compo 1, to dribbling forward and releasing the ball with power to clear from defence, switch play or put in accurate crosses the adidas V24 Compo 1 is the perfect balance. Before we move on to review power, the thing I enjoy most about the adidas V24 Compo 1 shaft, the XTREME24, is the curve. Yes, it’s reasonably high but it takes a distinct kink rather than a smooth bow. This gives you that great clasping effect over the ball you get from lower bow sticks, which retaining a more natural feel while dribbling. Power might be an area in which you would believe a 70% carbon stick fails on. I admit some previous Compo 1 sticks did lack a little in this area, compared to full Carbon models. To address this adidas have added their DUAL rod system in the 2015/16 V24 Compo 1 stick. Reinforcing the internal cavity of the hockey stick with carbon rods that create 3 chambers to disperse power and push more of the stick in to the ball, this V24 Compo 1 is noticeably more powerful than last year. This power is particularly noticeable when slapping the ball. Because of the position of the DUAL rods my V24 Compo 1 forgave me for catching the ball slightly higher than the head of the stick than I would have liked and delivered power to the slap pass regardless. Last thing to mention in this review of the adidas V24 Compo 1 is the weight. I recently converted from medium to light sticks and holding a Superlight version of the adidas V24 Compo 1, I wish I had that. People often say they want more weight to tackle, that’s nonsense, the lighter sticks give you more control to channel your opponent and plenty of weight to make solid challenges. The V24 Compo 1 is a light and very solid hockey stick. The superlight version would give your arms so much love by the end of each game it would pay for it’s self in no time. 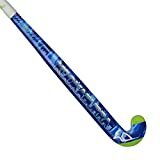 Ok, if you want to drag flick and spin round with the ball glued to the bottom of the stick to show off then the shaft of the V24 Compo 1 isn’t for you, you might want to look at a stick with the XXTREME24 or go low with another brand.